Showbiz reporter Nelson Aspen today celebrated his 15 years with Sunrise. US-based Aspen was at Brekkie Central today to reflect on his years of reporting on Hollywood & Broadway. He was greeted with nostalgic clips courtesy of Sam Armytage. Meanwhile Aspen will also open his new cabaret show, “Just in Time,” at New York City’s iconic Don’t Tell Mama on April 5 and 12. “Imagine going to Studio 54 for a dinner party with Irving Berlin, Julie Andrews, Barbara Eden, Harry Connick Jr and The Captain & Tennille!” he said. Not to try to sound rude but he’s still there? I thought he was given the sack or he retired not long after the new set was introduced. P.S. 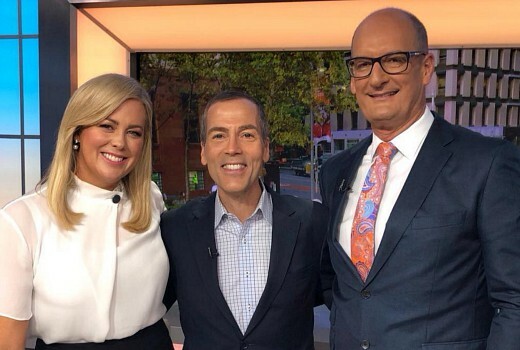 ABC News Breakfast/Mornings are my main choices for news in the morning but sometimes watch only the news headlines/sport/weather on Sunrise so would not have known for sure if Nelson Aspen was still doing the Showbiz stuff. Nelson is a total class act, always keeping on the right side of celebrity gossip without being nasty. A terrific innings. I think Nelson is the best thing on Sunrise. I was very disappointed when they gave the entertainment reporting to Eddie and we see less of Nelson except when Eddie is on other duties. He still is gorgeous but wow 15 years ago he was a real babe ! !